Merry Meet! Thank you for your interest in Athens Pagan Pride Day 2018! All Vendor Sites have been claimed. If you would like to be added to our waiting list, please complete a Vendor Registration Form. We will contact you as soon as possible, if and when a Vendor Site opens up. APPD encourages all types of vendors, especially, but not limited to those offering books, tools, clothing, herbs, etc. 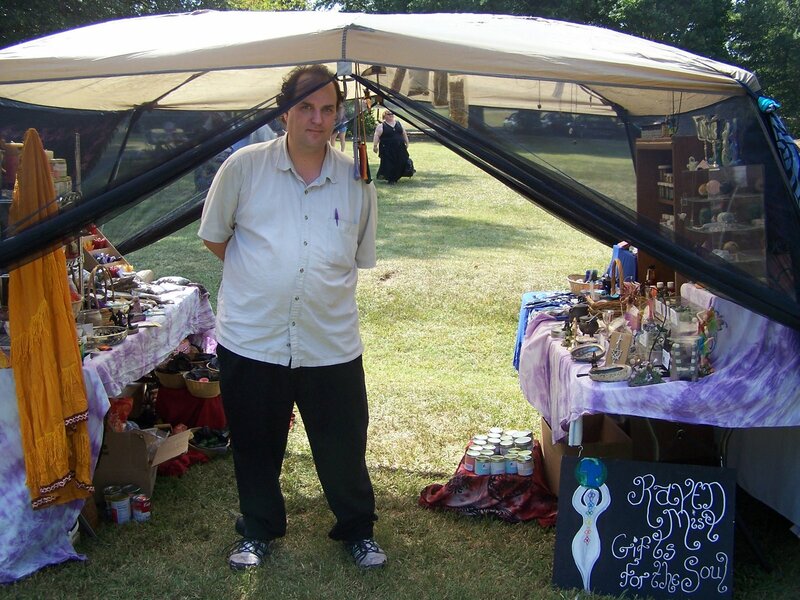 of interest to the Pagan community; food and drink; arts and crafts; services; and entertainment for children, i.e. face painting. Feel free to browse past APPD vendors for an example of these types of businesses. We do charge a nominal registration fee of vendors to offset the production costs associated with the festival. Large, 20’x10’: $60 advance or $70 day of. To make a large space, reserve two small spaces side-by-side. For example, you could say "all of site 1" or "1a and 1b". You still only pay for one large site. Please let us know if your tent will be larger than 10' on its smallest dimension. Place that info in the additional comments section. We might have to put you in a site you can spill onto the sidewalk: we can't let you block the emergency access. Small, 10’x10’: $40 advance or $50 day of. To receive the early bird registration rate, you must reserve AND pay for your vendor site by October 12, 2018. We do not charge non-profit groups wishing to provide services, but spaces are limited. So, please reserve early. Please also understand that if your wares might be in any way considered dangerous, we will have to ask you a number of questions for our insurance. We realize these questions are annoying and appreciate your patience and understanding. You may specify the site you wish to reserve when paying, referring to the vendor sites map. Please select up to three spaces in order of preference. All registrations are processed on a first come, first serve basis. We will notify you upon receipt of your registration payment and confirm your site location at that time. The deadline for online vendor registration is October 12, 2018. Payment will be accepted on-site, but remember that you cannot select your site until payment is received. Vendors who show up the day of the event may have to wait patiently for us to have a spare moment, and they will be allowed to choose leftover spaces on a first-come, first served basis. Please complete the vendor registration form if you wish to sell products or services at APPD 2018. Vendor registrations canceled no less than three days prior to the festival will be refunded. Additionally, all registration fees will be refunded in the event of a festival cancellation due to weather. Vendors who pay in advance, but fail to arrive for the festival will not be granted a refund. With regard to vendor set-up at the festival, you may arrive as early as 1 PM, and please arrive by 3 P.M. We will have numbered flags marking vendor booth locations and a site assignment listing to help guide you to your area. Set-up should be complete and booths ready by 5 P.M. Please plan to stay the entire time until 10 PM. Vendors must provide their own tables, tents, etc. Due to insurance and legal limitations, alcohol sales are not permitted. Keep in mind that this festival is in a family-friendly venue open to the public. All booth displays should be appropriate for this setting. Last, but not least, please leave your vendor site cleaner than when you found it. Unfortunately, there are a few types of vendors we cannot allow. Political parties or organizations. Because APPD is a religious, non-profit event, we cannot allow political parties or organizations whose goal is the promotion of a particular candidate, party, legislation, political system, etc. We can, however, allow very broad and unbiased activities, such as voter registration drives. Potentially dangerous activities. Since this is a public outreach event, we prefer to not allow dangerous activities. In the past, we have considered archery and axe-throwing demonstrations among others. While we think these are fascinating and worthy activities, we have decided not to allow them at the event. Activities that are very likely to offend. Again, since this is a public outreach event, we prefer not to allow activities or displays that are very likely to be offensive to the general public. For example, we would consider any display that is openly hostile to a particular group of people inappropriate. Likewise, displays that are prominently placed and explicitly sexual in nature would be inappropriate.